After a short introduction of bleeping electronics and synth strings, Thy Kingdom Gone piles into a strutting symphonic black metal, replete with squawking harsh vocals. 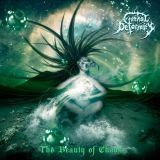 But to counterbalance, in come Przemyslaw Kajnat’s harmonised clean singing, which is somewhat reminiscent of Katatonia, and this juxtaposition characterises much of Eternal Deformity’s music. The tunes they pluck out on this track interweave with the haunted-house synths, gradually morphing into an almost power metal climax, adorned by some neat lead soloing. Pestilence Claims no Higher Purpose opens with grandiose piano-bashing, putting me in mind of Opeth’s Silhouette (from Orchid), which dissolves into a freewheeling jumble of atmospheric lullaby sections and scratchy doom-death. It is unpredictable and entertaining. The strongest tracks here are, in my view, Caught Out Lying and The Sun, both of which make much use of the band’s varied dynamics. The former begins with spaced-out prog noodling, building into a lumbering stop-start doom riff, and then into trundling melodeath overlaid by a nifty synth solo. Lovely. And the latter makes superb use of its spooky quiet passages, with subtly effective use of single-finger piano plinking blossoming into another big, melancholy chorus. So, a nice album. It reminds me of Septicflesh, in the way it brings heavy use of synth strings to bear on strangely-angled metal, but it is also rather more accessible, drawing on the tuneful likes of Katatonia and Paradise Lost. Worth the time of adventurous gothic doom fans.